Miriam joined the Campus Estates Animal Hospital Team in April, 2017. She has obtained a BA degree in Interdisciplinary Sciences at the University of Puerto Rico where her love for animals guided her to carry out a research project on the health and welfare of Rhesus macaques and form part of a bustling TNR program. 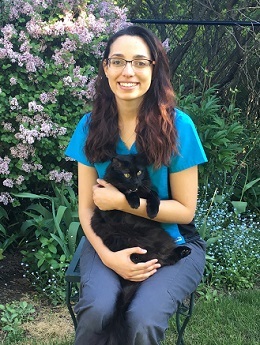 This love for animals brought her to Canada with her tropical companion, Oby, where she graduated from the Veterinary Technology program at the Ridgetown Campus. During her free time, she enjoys exploring new places throughout Canada, spending time with friends and curling up on a couch to watch her and Oby’s favourite shows.